Cool country and quite a surprise for us. We extended our stay here to see more things and intend to come back. 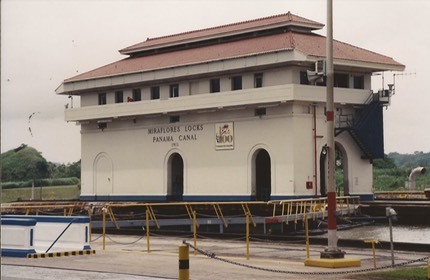 Panama City is modern and well services, but we chose to stay in the dangerous old port area which was fun. The canal is impressive and had some great bird watching nearby. In northern Panama we trekked in the hills around Panama's only volcano and then moved onto the coast where an island national park called Bocos del Toro sits. It was lovely and gave us the chance to snorkel and dive to brush up on our skills from Oz before diving further up in Central America. 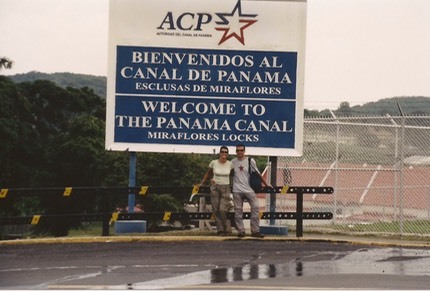 Here we are on our visit to the Panama Canal at Miraflores Lock. In the centre of Panama, about 4 hours from David, we stayed in a guesthouse in their last room. There was no covering it up, it was the garage!!. Not too bad though and the guy mapped out some walks for us, for which we needed to catch a bus and ask for a specific drop point. Mission accomplished we walked for about 6 hours, seeing lots of hummingbirds and some other species. On our return we decided to walk back along the road which was OK for a couple of hours but then it started to rain heavily. Fortunately, soon after, a minibus came by and picked us up. For half the normal price he took us back to town, and we got to talk to a nice lady and her son, who was totally in love with Princess Diana. Weird. Whilst on the Bocos islands we took a trip that had some dolphin watching, snorkelling and then a stop on an island famed for its very small red frogs.